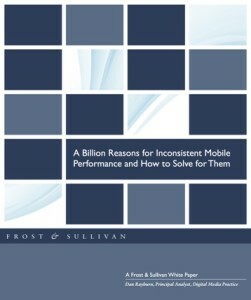 Frost & Sullivan has just released a new white paper entitled “A Billion Reasons for Inconsistent Mobile Performance and How to Solve for Them“, which is sponsored by and includes data from Twin Prime. Mobile is now the first screen of choice. It’s the most personal device we have had and is rarely a few feet away from us at any given time. Consequently, the gratification amount and user intent is highest on smartphones than any other computing device. However, many times our mobile experience is poor and can be as bad as content not even loading. In every benchmarking study, mobile performance is at least three times as slow as the Web. For example, Keynote Systems reports that today, on average, an m-commerce app/site loads in about 8 seconds on our mobile devices. This compares poorly with 2-second load times for websites. Read more about mobile performance challenges by downloading the white paper for free from Twin Prime’s website.